← 431 "How the Test Was Won"
The Simpsons bury their couch after they find it beaten up and torn, then go to a ranch to get a new one. After the new couch bucks Homer off its back, Homer is seen in a full body cast. "No Loan Again, Naturally" is the twelfth episode of season 20. It originally aired on March 8, 2009. The episode was written by Jeff Westbrook and directed by Mark Kirkland. "When the adjustable rate on Homer and Marge's mortgage resets at more than they can afford, they must put their home up for sale. Good Samaritan Ned Flanders buys the house and rents it out to them at an affordable rate. But Homer pushes his luck too far when he takes advantage of Ned's generous land lording duties." The Simpsons throw a Mardi Gras party, having invited most of the town. Marge asks Homer to invite Ned, which he reluctantly does. As they clean up the party the following morning, Lenny asks how they pay for the huge yearly party. Homer gleefully confesses that he borrows from a home equity line to do so, calling his home a "sucker" for getting stuck with the bill. Marge and Homer visit their mortgage broker, Gil Gunderson after receiving a letter and find out that their adjustable rate mortgage payment has increased drastically because of Homer's ineptitude. 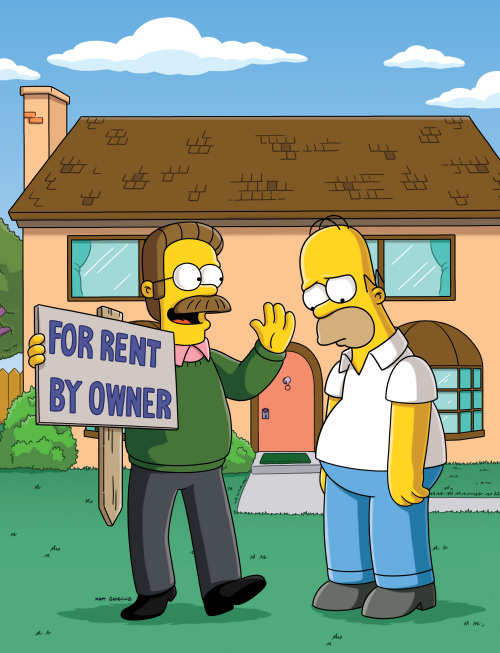 The Simpson home goes up for auction and after seeing the Simpsons' sorrow, Ned outbids Mr. Burns, purchasing the home for $101,000 and then offers to let the Simpsons move back in and rent the property from him. The Simpsons thank Ned with a song and a small celebration, when Marge notices the sink faucet dripping. Ned offers to fix it, as he is now their landlord and the repairs are his responsibility, along with some other items that he is obligated to correct. However, Flanders quickly tires of their constant requests for repairs. After denying just one of their constant requests The Simpsons decide to go to the media and complain about their horrible new landlord, provoking Ned's anger. He tells them they must leave at the end of the month. The Simpsons try several schemes to avoid eviction, but are unsuccessful and return home from a walk to find their items on the lawn. The family spends a night at the town's homeless shelter wondering how they will ever rebound. Flanders interviews a couple of potential tenants when he sees a picture from the move-in celebration and is reminded of the happiness and admiration of the Simpsons. Realizing that he should allow them to move back in, he sends the potential tenants away and the Simpsons return to their home, which sends every other resident on the street running for their "for sale" signs. This episode was seen by 5.99 million viewers. IGN rated the episode 6.9 out of 10. Modified on June 3, 2017, at 17:52.